Jeremy Hunt has lived in West Sussex for nearly 40 years and in Chichester itself for 34 years. He is married to Gill, who is a fourth generation Cicestrian and they have two grown up daughters. Jeremy spent most of his working life in the steel stockholding and processing industry, based in Chichester. With his five fellow Directors he helped build a successful group of Steel Service Centres throughout the UK. Jeremy retired in 2008. Jeremy was a member of Chichester Round Table where for a time he was responsible for liaising with, and supporting, many local charities. In 1989 he was involved in organising the first Chichester half marathon in support of the Chichester Observer Scanner appeal. Jeremy has for many years been a member of the Summersdale Residents' Association and on retirement became more actively involved in local issues by joining the committee. 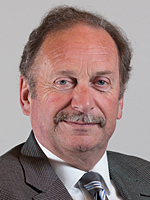 His first post was Assistant Planning Secretary and then in 2010 he took over as Chairman, a role he carried out until his election to the County Council in May 2013. Jeremy is a keen dog walker and having studied agriculture when he first left school, is still very interested in rural and agricultural issues. He is a keen supporter of Bath rugby and manages to get to most home games. His other interests include motorsport, classic cars and the theatre. Jeremy is very keen to represent all the residents of Chichester North, whether living in rural areas, in villages or in the city and he plans to support them by concentrating his energies on the issues that affect their daily lives. Jeremy is the Cabinet Member for Finance and Resources.